You can learn a lot of things from the flowers, like how to save your money and how to keep it safe. 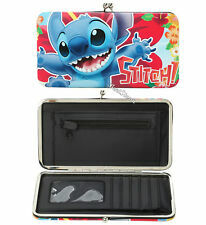 Start off with this patent leather zipper wallet from Disney's Alice In Wonderland. It features an image of Alice with the wild flowers on one side and a purple Disney x Loungefly plaque on the other. FAUX LEATHER ZIP AROUND WALLET WITH APPLIQUE AND 3D BOW DETAILS. Sku: WDWA0767. Nightmare Before Christmas Zip Wallet. FAUX LEATHER ZIP AROUND WALLET WITH DEBOSSED AND APPLIQUE DETAILS. Material: Faux Leather. Hinge wallet with a Stitch hibiscus design and kisslock closure. Inside has clear ID display, card slots and billfold. DISNEY Presents. This is a Nightmare Before Christmas Chibi Character Print Zip Around Wallet. This great looking wallet is produced by Loungefly. Loungefly is well known for making high quality women's wallets. This cute wallet measures 8 inches long and 4 inches high. It has a nice Nightmare Before Christmas themed chibi print on the front and back. Great for any fan of the Nightmare Before Christmas. Please Note: Pattern will vary. Recommended Age: 14 Condition: Brand New Dimensions: 8" x 4 " X Loungefly Nightmare Before Christmas Chibi Character Print Zip Around Wallet. This is a Disney Minnie Mouse Cream Wallet. Produced by Loungefly, this wallet is quality made and looks fantastic! It has all of the normal features that you'd expect in a wallet and the design is stellar. It's made of a durable faux leather material and Loungefly is well known for making great quality accessory items. Super cool! Perfect for any fan of Minnie Mouse. Recommended Age: 8 Condition: Brand New and Sealed Dimensions: 6.5" x 3.75" x 1" X Loungefly Disney Minnie Mouse Cream Wallet. Can you feel the love tonight?. The peace this wallet brings. Your cards, for once, in perfect organization. Simba and Nala adorn both sides with a line art inspired background. This zipper wallet from Disney's The Lion King includes 8 card slots, zipper pouch and two billfolds with an interior lining of red, green and yellow hearts. This is a Disney Maleficent Face Zip Around Wallet made by the good people over at Loungefly. Made of a faux-leather type of material, it's a perfect everyday wallet. 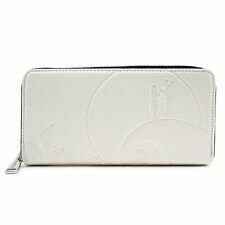 Measures roughly 8 inches long, has multiple card slots and a zippered coin pouch. Great for any Disney fan. Recommended Age: 8 Condition: Brand New and Sealed Dimensions: 8" x 4" X Loungefly Disney Maleficent Face Zip Around Wallet. 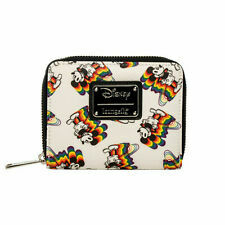 This cream tone zipper wallet features Mickey Mouse peeking in the middle with echoed rainbow silhouettes. Features 7 card slots, clear ID display, 3 billfolds and a zipper closure pouch. Approximate size: 8" x 4". This is a Disney Loungefly Star Wars Darth Vader wallet. Beautiful burgundy color with interior floral print. White "VADER" stitching in front of wallet and bronze hardware. Wallet has zippered coin pouch in middle with 8 card slots. It's got a printed lining, 8 card slots, billfold, and an interior zip pouch! Approximate size: 8" x 4 1/2". This adorable wallet features everyone's newest favorite droid with a zip closure for security, interior zipper pocket for coins, two (large) open pockets, and eight card slots. The images shown are of the wallet that you will receive. This is a Marvel Black Panther Purple Black Zip Around Wallet produced by the good folks over at Loungefly. Loungefly is well known for making high-quality accessories and just great stuff in general. Seriously, their stuff is fantastic. This wallet is made of a durable faux-leather material and looks great. Measures roughly 8 inches long and 4 inches tall and has a Black Panther themed design. A great wallet for any fan of Black Panther! Recommended Ages: 12 Condition: Brand New Dimensions: 8" x 4" Loungefly Marvel Black Panther Purple Black Zip Around Wallet. Sku: WDWA0650. Disney Beauty and the Beast Belle Charm Wallet. SAFFIANO FAUX LEATHER ZIP AROUND WALLET WITH DEBOSSED DETAILS. Color: Cream. Star Wars Disney Loungefly The Force Awakens BB-8 Clutch Wallet New with Tags! Only princesses can get away with not carrying any money, even though they may risk losing a hand! Featuring an allover print of jasmine flowers and an embossed and embroidered Raja on the snap clasp. Sku: WDWA0741. 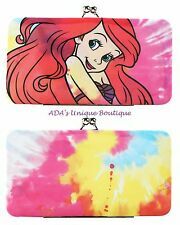 Disney Moana Zip Wallet. Zip around wallet. Material: Faux Leather. Sku: WDWA0774. Disney Winnie the Pooh Zip Wallet. FAUX LEATHER ZIP AROUND WALLET WITH PRINTED AND APPLIQUE DETAILS. Graphic on: Front & Back. Sku: WDWA0731. Evil Queen Face Wallet. FAUX LEATHER ZIP AROUND WALLET WITH PRINTED, EMBROIDERED AND APPLIQUE DETAILS. Color: Black, Purple. Graphic on: Front. Sku: WDWA0783. Minnie Mouse Sequins Wallet. SAFFIANO FAUX LEATHER ZIP AROUND WALLET WITH SEQUIN DETAILS AND 3D BOW AND EARS. Material: Faux leather. Trending at C $54.14eBay determines this price through a machine-learned model of the product's sale prices within the last 90 days. Don't underestimate the power of the Dark Side and what it can do for your fashion sense! This Black Jedi Wallet from Loungefly features Darth Vader who's ready to guard both the credit cards and cash. Loungefly Star Wars Darth Vader darkside wallet Embossed detail. Black patent faux leather. Zippered and snap sections divided for easy organization. ID window and credit card slots inside. Zip around closure. Approximate sixe 8" X 4". Be sure to check out our store for the matching satchel purse. LOU240 STWA0001. Sku: WDWA0766. Mickey Mouse. Faux leather exterior with fabric interior. Material: Faux leather. Style: "Alice and Queen of Hearts Wallet". FAUX LEATHER TRIFOLD WALLET WITH PRINTED DETAILS. Sku: WDWA0775. Nightmare Before Christmas Studded Wallet. FAUX LEATHER BIFOLD WALLET WITH ANTIQUE SILVER STUDS AND TOP STITCH DETAILS. Material: Faux Leather. Carry the strength of a comic book superhero where ever you venture! Color:Black Multi. Give us a shot and we will make sure that you will look to us again! Size:One Size. Item model number: MVWA0084. Sku: MVWA0084. Black Panther Wallet. Material: Faux Leather. Color: Black Purple. Graphic on: Front & Back. 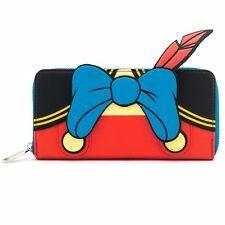 Pinocchio Zip Around Wallet. FAUX LEATHER ZIP AROUND WALLET WITH PRINTED DETAILS. Material: Faux Leather. Loungefly's Disney black sequin wallet features Minnie Mouse 3D ears. Front includes her iconic red bow. Each sequin is triple sewn in place. Full ziper closure. Spacious interior will hold a cell phone as large as an iPhone X. Red with white polka dot print lining. You can learn a lot of things from the flowers, like how to save your money and how to keep it safe. Start off with this patent leather zipper wallet from Disney'sAlice In Wonderland. It features an image of Alice with the wild flowers on one side and a purple Disney x Loungefly plaque on the other.